We receive information from Westminster City Council and Camden Council on planning and licensing applications. We respond with comments on a great number of these applications. This is a volunteer-led project helping to meet the objective of promoting a healthy built and social environment for people living in Fitzrovia. The project also promotes educational advancement by giving people the opportunity to learn about the local planning and licensing authorities. We are a recognised amenity group for both these councils. 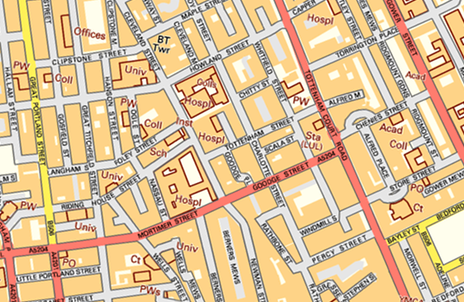 We support the Charlotte Street Association who comment on planning and licensing applications in Camden and we also work with the newly established neighbourhood planning forums: Fitzrovia West Neighbourhood Forum and Fitzrovia East Neighbourhood Forum. Our neighbourhood, because of its location in central London, is constantly under pressure from building and commercial development. These developments have the potential to negatively affect the lives of people living in Fitzrovia. These commercial schemes have the resources to employ a small army of consultants and lawyers to influence local authority decision-makers. Yet the defence of the Fitzrovia neighbourhood is entirely reliant on the time and tireless commitment of local residents given free of charge. Funding for this work is very difficult to obtain. Currently we cover the cost of this project from within our running expenses and entirely by pro bono work. However, we make the best of our small resources and many of the issues we comment on and work with other organisations on we also publicise through our own community newspaper Fitzrovia News. The outcome of this project is that people are better informed about these important issues and better able to contribute to shaping local democracy. Our community also has a stronger voice when our efforts are organised and co-ordinated. Whilst the work is time-consuming and the pressure of commercial regeneration on our neighbourhood is very high, the act of coming together to tackle these issues spills over into forming social networks amongst like-minded people. This realises the additional outcome of the social benefit from people coming together to deal with issues that concern them.